The Rick & Bubba Experience Live On US Sports Network! Presented By BestBuy! The Indoor Football League On US Sports Net Week 9 | Arizona Rattlers at San Diego Strike Force Presented by Vimeo! The San Diego Strike Force host the Arizona Rattlers in Week 9 of the 2019 IFL season! Ad-free playback with Any Vimeo Plan! The San Diego Strike Force (1-6) will face the Arizona Rattlers (6-0) on Monday, April 22 at 7:05 p.m. PT at Pechanga Arena San Diego. SAN DIEGO – The San Diego Strike Force will enter this weekend’s matchup coming off their first win in franchise history after defeating the Cedar Rapids River Kings by a final score of 40-34 on April 14 at home. In the team’s first win, Strike Force quarterback Jihad Vercher started and went 12-19 for 114 yards in the air and two touchdowns, in addition to rushing for eight yards and a touchdown. Following his performance in the win, San Diego kicker Ernesto Lacayo was named the IFL Special Teams Player of the Week. Lacayo contributed the team’s only points in the third quarter with a 51-yard and 43-yard field goal. He also completed four of his five extra points attempts. Lacayo currently ranks second among kickers in the league with 59 points and leads all kickers in extra point percentage (97%). Strike Force running back George Moreira Jr. had 58 yards on 18 carries and one touchdown. Wide receiver Marques Rodgers contributed one rushing touchdown as he tallied 30 yards on four carries, and a receiving touchdown as he reeled in six catches for 43 yards. San Diego wide receiver David Carter had one catch for a 45-yard touchdown to end the half. Strike Force defensive back Omar Cook has led the team in tackles in three consecutive games. The undefeated Arizona Rattlers improved to a 6-0 record as they took down the Tucson Sugar Skulls 55-41 in Week 8. Rattlers defensive back Phillip Henry returned an interception 45 yards for a touchdown in the win. Defensive back Davontae Merriweather is tied for fourth in the IFL in tackles (47). Arizona running back Jabre Lolley leads the IFL in scoring (96 points) and is tied for second in rushing touchdowns (12). Monday will be the second all-time meeting between the two teams, with the Rattlers previously taking a 91-58 victory in their first matchup on April 6. Arizona leads the IFL in scoring offense (66.5 ppg), rushing offense (115.3 ypg), interceptions (10) and is second in scoring defense (37.5 ppg). San Diego has the league’s top passing offense, averaging 181.1 ypg. Cincinnati vs. Florida | NCAA Lacrosse Live Presented by Vi Virtual Fitness Trainer! Galloway, Onuoha Lead Howard Women’s Track & Field at the Morgan Legacy Presented by StrengthCoach! BALTIMORE (April 20, 2019) – Howard University women’s track & field grabbed fourth overall at the 2019 Morgan Legacy, hosted by Morgan State, after compiling 88 points in the two-day event. The 18-team competition took place at Hughes Stadium. Senior Lauryn Galloway (East Brunswick, N.J.) and junior Uchechi Onuoha (Yardly, Pa.) led the way, winning their respective events. Galloway scored 10 points for HU after placing first overall in the women’s javelin. The New Jersey native threw over 119 feet (36.52m). After winning her heat in the women’s 100-meter hurdles with a 14.10 mark, Onuoha put on an encore performance by winning gold with a season-best time (13.79). The Pennsylvania product also competed in the 400-meter hurdles where he took fifth overall (1:02.20). The 4x400 relay squad consisting of juniors Sydney Benson (Grosse Pointe Woods, Mich.) and Oluchi Ike (Upper Marlboro, Md.) and sophomores Jessika Gbai (Philadelphia) and Ozioma Scott (Georgetown, Guyana) finished runner-up, clocking in at 3:46.14. Individually, Gbai took second overall in the women’s 100-meter dash with a season-best (11.83). Fellow classmate Ameenah Saalih (Willingboro, N.J.) also participated in the race where she placed fourth after running a season-best (12.01). For her efforts, she qualified for the 2019 Eastern College Athletic Conference (ECAC) Outdoor Championships in Princeton, N.J.
Other notable running performances include Scott placing fourth in the women’s 400-meter dash with a season-best (54.38) and newcomer Melanie White (Orlando, Fla.) taking fifth overall in the 1500-meter (4:49.36). In the field, second-year thrower Kaylah Clark (Miami) had her best day as a Bison. The Miami native set season-best in the women’s hammer throw (48.04m; 157’7”), shot put (12.42m; 40’9”) and discus (41.62m; 136’6”). Senior Mi-ah Watkins (Bronx, N.Y.) also competed in the hammer throw where she tossed a season-best (44.97m; 147’6”). Another noteworthy effort in the field was sophomore jumper Rachel Edler (Stone Mountain, Ga.) leaping over a season-best 38 feet in the women’s triple jump. To view results from the 2019 Morgan Legacy, please click here. On April 25-27, Director of Track and Field David Oliver and the Bison travel to the City of Brotherly Love for the prestigious Penn Relays, hosted by the University of Penn. Help This and Many Student-Athletes Achieve Their Collegiate Dreams. Give To the US Sports Student-Athlete Outreach Program! LOVETHELIFT for a $50 instant savings. “This book of the law shall not depart out of thy mouth; but thou shalt meditate therein day and night, that thou mayest observe to do according to all that is written therein: for then thou shalt make thy way prosperous, and then thou shalt have good success” (Joshua 1:8). God wants us to prosper and succeed. We position ourselves for prosperity and success when we let His Word be our guide in life. See Your Favorite Artists Live! The Rock Almighty! Shaker Of Heaven and Earth Coming To US Sports Radio Spring 2019! In this final episode of our Less Is More series, hear Joseph share a personal story of how God’s strength was made perfect in his own weakness—and in fact, made him the preacher he is today! If you’ve ever felt crippled by your flaws, this is for you. When God is in the picture, our weaknesses become canvases for His grace. Press play and tag someone whom you know needs to hear this. Shop Electronics + Spend $35, Get Free Shipping on Select at Target online! Shop at Peapod Delivers​ to help you Save money! Sort and compare prices, track your total, and limit impulse purchases when you shop! Save 20-50% off fitness bundles from BodyRock. Get the gear you need. Shop now. Dr. Ann Shippy http://bit.ly/DrAnnShippyBooks discusses a couple of foods that she finds, when removing, benefits most of her patients. Find out what these foods do in your body and why maybe trying to remove them, can give you an indication of whether or not they are affecting you as well! Body Cam, Fatal Shooting, Chase, Videos, 911 Calls, Detail. The Rock Almighty Devotional, Praise, and Worship with The Violet Burning. “And now, brethren, I commend you to God, and to the word of his grace, which is able to build you up, and to give you an inheritance among all them which are sanctified” (Acts 20:32). The Word of God’s grace is Jesus, Himself. He can build us up and strengthen us like no one else can. Check out MooseJaw's Latest Sales and Clearance! 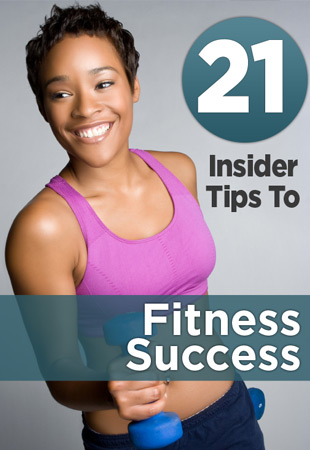 Presented on US Sports Net By Yahoo Small Business! Presented on US Sports Net By WBShop! NUGGETS vs SPURS | Nikola Jokic Leads Denver’s Rally in San Antonio | Presented by StrengthCoach! The Indoor Football League on US Sports Net - Week 9 | Tucson Sugar Skulls at Quad City Steamwheelers Presented by Perform Better! The Tucson Sugar Skulls experienced their first-ever home loss on Sunday, when they fell to the Arizona Rattlers 55-41 at Tucson Arena. Quarterback Jake Medlock received the nod as a starter for the second straight game over Matt Behrendt, who was coming off a two-interception performance against Nebraska. Medlock completed 11 of 23 passes for six touchdowns, but threw two interceptions in the fourth quarter, including a 45-yard pick that was returned for a touchdown by Arizona’s Phillip Henry. “Early on, he played well. Obviously the two turnovers don’t help It was just Jake pressing a little bit and relying too much on his arm and not enough of his head,” Sugar Skulls coach Marcus Coleman said. Tucson will get two more shots at the Rattlers, including a May 25 contest in Tucson. In the meantime, Tucson (3-3) will prepare for this week’s road game against the Quad City Steamwheelers. The Sugar Skulls boast the top offense in the league, averaging 275.7 yards per game, but have been tormented by turnovers lately. Medlock and Behrendt have combined to turn the ball over five times in the last two weeks. The three interceptions and a fumble against Nebraska ultimately cost Tucson in a 53-47 loss. The Sugar Skulls hung around, just like they did against the Rattlers, but turnovers and momentum plays did them in. On Sunday, the Sugar Skulls led 14-7 after the first quarter and had a chance to lead by two scores, but Diego Marquez missed a field goal. At halftime, the game was tied at 21, and Arizona took a 34-28 lead in the third quarter. When Marquez attempted to cut into that lead, Arizona defensive lineman Chris McAllister blocked the field goal, sending the ball into Tucson’s end zone where cornerback Dillion Winfrey recovered it for a touchdown. A blocked field goal recovered in the end zone is what sparked Arizona’s 14-point swing against the Sugar Skulls in Phoenix. Tucson’s three losses all came roughly the same way, Coleman said. “It’s all self-inflicted. A lot of those scores that we’ve given away this year has been because of what we didn’t do, not necessarily a team beating us,” he said. Normally, linebacker Zach Allen is the week-by-week leader of Tucson’s defense. Sunday, however, it was the secondary that stepped up. Cornerback Cam Gaddis and ex-LSU defensive back Micah Eugene led the team with six tackles each. Eugene had a pass breakup and a spectacular near-interception. He picked off Rattlers quarterback Jeff Ziemba in the corner of the end zone and flipped over the out-of-bounds wall, but a roughing-the-passer penalty by Tucson voided it. At 3-3, Tucson is fifth in the IFL standings. The Rattlers and Iowa Barnstormers are tied at the top with 6-0 records, while the Sioux Falls Storm are 5-1 and the Green Bay Blizzard sit a 5-2. The San Diego Strike Force’s win over Cedar Rapids means there’s only one winless team left in the league: Bismarck at 0-6. Where in the world is Quad City? The Quad City Steamwheelers are based in Moline, Illinois, which is close to the Iowa border. The team is named after sternwheelers, large steam paddleboats that can be seen on the Mississippi River that separates the Iowa-Illinois border. The franchise was a part of AF2 from 2000-09. The team then folded, but returned in 2018 to join the Champions Indoor Football league; it moved to the IFL at the start of this season. Quad City plays its home games at the Tax Slayer Center, which seats 9,200 fans. Before last Sunday’s loss, the Sugar Skulls added wide receiver and return specialist Treydonte Hill. The Tabor College (Kansas) product returned seven kickoffs for 100 yards, including a 31-yard return. The Nebraska Danger host the Green Bay Blizzard in Week 9 of the 2019 IFL season! Third time’s the charm – or at least the Nebraska Danger hopes so. Yet again, the Green Bay Blizzard has gotten the best of the Danger in a 60-50 loss just a week ago, but the Danger are looking to return the favor in a quick turnaround game against the Blizzard this weekend. Tommy Armstrong Jr. continued at his blistering pace this season in the most recent loss, throwing for 4 TD’s while running in for another two. Greg Dent shined in the game for the Danger as well, pulling in three of the four receiving TD’s in the loss. Green Bay however got plenty of production out of their quarterback as well. Lenorris Footman didn’t do much through the air, but he scorched the Danger on the ground. Footman rushed for 118 yards and 4 TD’s in the Blizzard win. It also highlights what Nebraska needs to do this Saturday if they look to salvage a win in the three-game season series with Green Bay. Peapod makes it easy to shop and save! Check out weekly sale items, use ExpressShop to easily find your groceries, and create a personal shopping list to easily re-order on staples for your home! While a 3-4 season is certainly nothing to write home about for the Danger so far this season, history could be in the making with former Husker turned Danger QB Tommy Armstrong. He currently has 14 rushing TD’s on the year through seven regular season games with seven more to go. If he maintains that pace, he could break his offensive coordinator’s record. Jameel Sewell scampered for 25 rushing TD’s in 2013. Armstrong is on pace for 28 by season’s end. The Danger can use all the running help they can get as they look to run the Blizzard out of Grand Island with a loss on Saturday. WORCESTER, MA - The Carolina Cobras (1-0) keep their championship momentum going from last season as they defeated the Massachusetts Pirates (0-1) tonight at the DCU Center in Worcester, Massachusetts, by a score of 54-22. The game was tight to start, with each team exchanging rushing and receiving touchdowns to knot the two teams at 14 a piece at the end of the first quarter. From there, it was all downhill for the Pirates. Cobras quarterback Charles McCullum and company lit up the Pirates the rest of the night, with the offense and special teams producing 34 consecutive points before the Pirates offense could get anything going. Their second-half scores, a 33-yard bomb to Marty Gilyard followed by a deuce from Rausa, proved to be too little too late. Carolina put the cherry on top of it all after wide receiver Jordan Jolly caught a 28-yard touchdown pass near the end of the game. By day, EJ Nemeth is teaches kindergarten, first grad, and second grade physical education at Foundation Academy and Charter School in Trenton, New Jersey. He also spends part of his days coaching football, wrestling and track at Notre Dame High School. It’s a day filled with long hours and hard work, but there are also days when Nemeth continues on to his other profession, a side gig that he’s pretty passionate about and makes sacrifices to keep going. After his day jobs, the 35 year old Nemeth gets into his car and heads to his night and weekend job for some fun. Nemeth is the starting quarterback for the New York Streets joins his teammates for practice in Brooklyn a few nights a week. Then, on the weekends, he’s battling opponents from around the National Arena League. The indoor football veteran quarterback led the Streets to a season opening win in Jacksonville this past Saturday night making all the long hours during training camp and in practice worth it. He’s not about to give all this up despite the sleep deprivation. Nemeth and his teammates stunned the Arena Football world by knocking off the Sharks this past Saturday night 52-41. The former Sacred Heart University quarterback completed 15 out of 26 passes for 208 yards, four touchdown passes and two interceptions while also scoring on two touchdown runs in the game. The offense did it’s job to build a big lead and then Nemeth credited the guys on the other side of the ball for preserving the win. As an expansion team, the Streets are fortunate to have a quarterback like Nemeth who has a wealth of experience and a championship resume. He has won three indoor football titles guiding the Baltimore Mariners (2010), Harrisburg Stampede (2013) and the York Capitals (2015) to championships. It was with Harrisburg and York where Nemeth worked with current Streets Head Coach Rick Marsilio. With Nemeth available, Marsilio wasted not even a New York minute to get him to the Streets. Nemeth jumped at the opportunity to be reunited with Marsilio and he appreciates the hard word that owners Corey and Tamara Galloway have put in to bring Arena Football back to New York. A football team is not just about the players and coaches on the field but about everyone in the organization working hard to make the franchise successful. In his short time with the Streets, Nemeth can see that this is going to be a franchise to be reckoned with. And now after the season opening win on the road, Nemeth and the Streets are getting set to welcome the NAL’s other expansion team, the Orlando Predators, to the intimate confines of the Westchester County Center for this Saturday night’s home opener. The Predators have had a storied history in Arena Football and now they are making their return. After an eleven year absence of Arena Football in New York, the fifty yard indoor war is back in town and the atmosphere on Saturday could very well be off the charts. The Indoor Football League On US Sports Net - Week 9 | Bismarck Bucks at Cedar Rapids River Kings Presented by Market America! 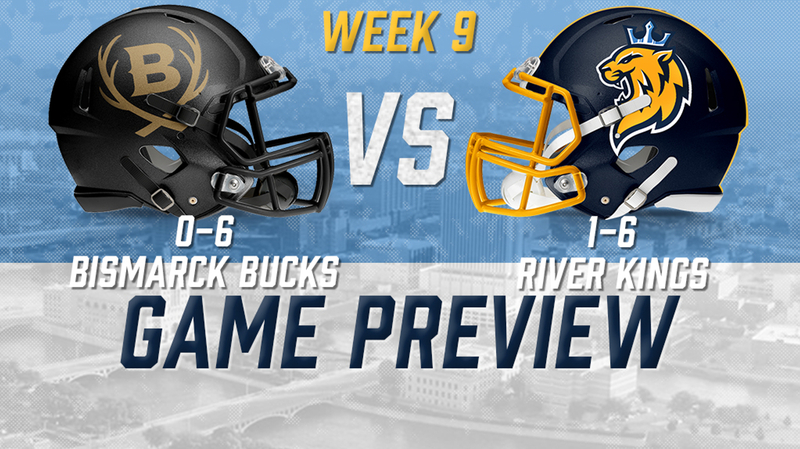 The Cedar Rapids River Kings host the Bismarck Bucks in Week 9 of the 2019 IFL season! Cedar Rapids - Looking for their first win since week 3, the Cedar Rapids River Kings (1-6) are hosting the Bismarck Bucks (0-6) this Saturday night at the US Cellular Center. Bismarck is another new opponent for the River Kings, who have already taken on three either new to the IFL, or brand new franchises this season. Their only win against such competition came against the San Diego Strike Force, a 65-48 win in Cedar Rapids. Cedar Rapids is looking to bounce back after a loss against that same Strike Force team in San Diego last Sunday. The River Kings were led by Nick Brassell in the loss, who not only racked up eight total tackles but also ran a short Strike Force field goal attempt back for a touchdown, cutting San Diego's lead to just 40-34 with 3:14 left in the game. The defense was unable to get San Diego off the field though, and the Strike Force ran the clock out for their first win in franchise history. The River Kings have committed to the run the last few weeks, with running back Nate Chavious racking up three touchdowns against the Strike Force last week and two the week before in addition to over a hundred yards rushing against the Iowa Barnstormers. Chavious is averaging just over 45 rushing yards per game this season, with a high of 89 yards against the Arizona Rattlers in week two. Overall the River Kings rank 2nd in the IFL in rushing yards, with 700 even, trailing only the Nebraska Danger's 758 total rushing yards mark. Quarterback Kurt Palandech is tied for first in the league in completions with 90 on the season and third in completion percentage at 63.8%. Finding the endzone often enough has been the River Kings' issue as Chavious is tied for 7th in total points in the league (66), but the team doesn't have another man in the top ten, with Marquel Wade coming in tied for 13th (60). Meanwhile Iowa, Nebraska, and even San Diego all have two scorers in the top 11. Palandech will look to continue to spread the ball around, as he has the last few games, completing passes to four different receivers against San Diego and five different receivers against Iowa in both their games in weeks 6 and 7. The River Kings defense should be able to get a solid game from their run defense, which desperately needs it. Cedar Rapids is ninth in the league in rushing yards allowed with 115.9 per game. Luckily the Bucks are ranked ninth in rushing yards per game, with just 66.5. Leading the way for the defense is Malik Slater, who has 46 tackles on the season (23 solos) which is good enough for sixth in the league. Bismarck is in their first year of competition in the IFL after having played the last two seasons in the CIF. They are looking for their first win of the season and are led by quarterback Homer Causey and running back John Gibbs. They lost to the Barnstormers last week 55-16 in a game in Des Moines. The game Saturday will kick off at 6:05 PM and tickets can be purchased here. If you're a college student or faculty member show and a valid ID at the door to get 10% off your ticket! 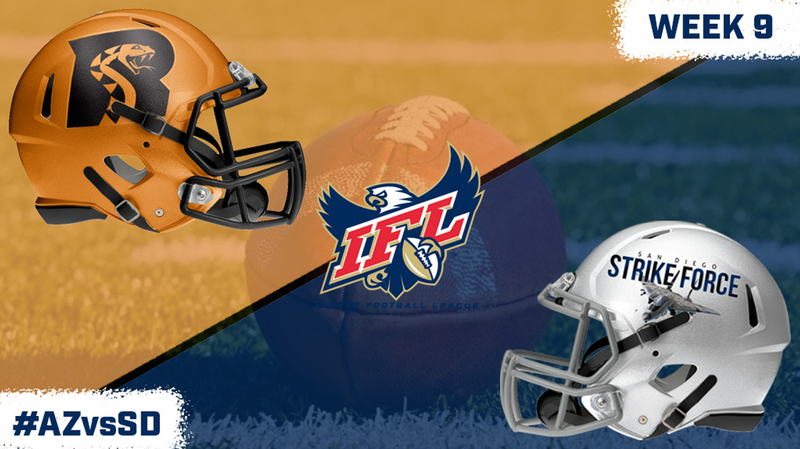 The IFL On US Sports Net - Week 9 | Iowa Barnstormers at Sioux Falls Storm Presented by Total Gym! The Iowa Barnstormers face off against the Sioux Falls Storm in a rematch of the 2018 United Bowl in Week 9! Extra 10% Off Total Gym Supreme plus Free Shipping! Discount applied at checkout! SIOUX FALLS, SD - The Sioux Falls Storm (5-1) will host the Iowa Barnstormers (6-0) on Saturday, April 20 for a 7:05 PM kickoff the Denny Sanford Premier Center. Showtime will start at 6:45 PM. The Storm look for redemption against the Barnstormers after losing their last two contests against them. The Storm and Barnstormers last faced on July 7, 2018 in the United Bowl where the Storm lost 38-42. The Barnstormers are coming off a dominant performance last week, in which they beat the Bismarck Bucks on the road 55-16. The league-leading Barnstormers defense shined all night against the Bucks, forcing five turnovers. The defensive backfield were responsible for four of those turnovers. Defensive back Tyrell Pearson had two interceptions and fellow defensive back Jourdan Wickliffe recovered two fumbles. On offense, quarterback Daquan Neal led the charge, passing for five touchdowns and rushing for one. The Storm were on a bye last week, but their last victory also came against the Bismarck Bucks, 64-31, on April 6. The only loss for Sioux Falls came against the only other undefeated team in the IFL – The Arizona Rattlers. The Storm are led by quarterback Lorenzo Brown Jr., who has thrown for 16 touchdowns and rushed for 10 in six games. His favorite target is receiver Brandon Sheperd, who averages a league-leading 71.7 yards per game. The Storm's defense will look to slow down a hot Barnstormers offense that average 52.2 points per game. Individual Storm game tickets are on sale at the Premier Center Box Office or online through www.ticketnetwork.com. 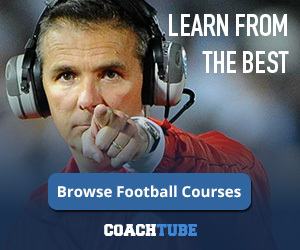 Football Strength Conditioning and Skills Development resources from CoachTube.com and StrengthCoach.com. EASILY go from 4-4 to a 4-2-5 to a 3-4 Defense ! Matches up with the READ and REACT videos on CoachTube. Do Your Defenders "Spot Drop" and Just Guard Grass? Then you need to pattern read and have your defenders drop based on the receivers routes. Learn the "Mix-It" or "Palms" COVER 2. It is the hybrid between Traditional Cover 2 and Quarters Cover 4. THE BEST OF BOTH WORLDS! Traditional Quarters COVER 4 is ran out of a 4-2-5 and a 3-4 Alignment. Unleash the Power of Plyometric "Combos"! Mike Kozak graduated from Ohio State University in 2001 with a B.S. in Sport Performance and Coaching and a Master’s Degree in Sport and Exercise Education. In 2004, he became a Certified Strength and Conditioning Specialist through the National Strength and Conditioning Association. He has also added a Speed and Agility certification through the International Youth Conditioning Association. If you want to jump higher, run faster and become a more explosive athlete, then you want to give Plyometic Combos a try! If you look at the movements involved in sports such as volleyball, football and basketball, you will find that athletes are required to jump, land and react continuously throughout the game. Sometimes you have to jump, land and then sprint. Sometimes you have to shuffle, jump and then shuffle again. I think you get the idea. Taking this into consideration, I have started to incorporate what I call “Combo Plyos” into my programs for advanced athletes. This doesn’t mean that I have abandoned speed drills or traditional plyometrics. I just like to mix a couple sets of these in during a power phase to keep training fresh. Set the hurdles in a line about 2 feet apart with the 12 inch hurdles on each end and the 6 inch hurdles in the middle. To start, the athlete will have their shoulders perpendicular to the first 12 inch hurdle. They will start the drill by explosively jumping laterally over the first 12 inch hurdle. Immediately upon landing, the athlete will perform a lateral high knee chop over the 3 six inch hurdles. The athlete will then gather themselves, explosively jump over the last 12 inch hurdle and then immediately back over. They will then chop back over the six inch hurdles and perform the jumps at the end. Have your athletes perform 2 – 3 sets of going down and back twice over the hurdles. The focus should be landing soft on the big jumps, moving from speed to power quickly and vice versa and maintaining body control.